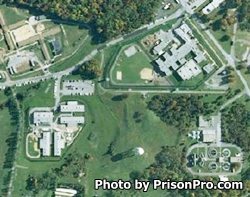 Brockbridge Correctional Facility is located in Jessup Maryland. It is a minimum security institution that houses over 640 adult males. Inmates at this prison can earn a GED, and take classes for reading, writing and math. This facility is part of Maryland's Pre-Release system, and helps prepare inmates for release by teaching them interview skills, resume writing and computer courses. Brockbridge Correctional Facility employs 219 people and has an operating budget of $23.4 million. The average cost to incarcerate an inmate at this prison is a little over $40,500 per year. Visitation occurs on Wednesdays and Fridays from 7pm-9pm, and on Saturdays, Sundays and state recognized holidays from 9am-11am, and 3pm-5pm. Inmates can have two visits each week, the duration of the visits are one hour. State recognized holidays include New Year's Day, 4th of July, Thanksgiving, and Christmas.